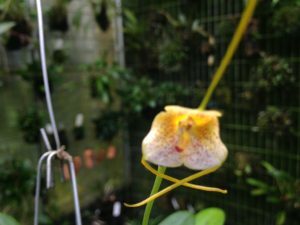 This cute Masdevallia from Peru is named after the lute shaped lip (its actually rather small so a teeny weeny lute) The thing we like more is the dramatic spotting and the flowers crossed legs (tails) which give it an unusually relaxed look. Masdevallia pandurilabia comes from really cool high altitude cloud forest above 2600m altitude and loves it cool and moist with good air movement. Some species from similar habitats are a challenge in a greenhouse but this species seems to be a vigorous grower and as you can see from the photo on the left produces lovely glossy leaves too. We grow this species in baskets of bark and moss and give it a minimum of 10C. 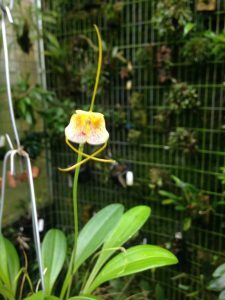 It is reported as growing as a terrestrial in leaf litter as well as an epiphyte which may explain the unusually long flower stem for a flower of this size.